There are technologies which are mostly ignored by the general public and regular news outlets. Powerful pulsed lasers are one of those overlooked technologies. Powerful pulsed lasers will enable the generation of large amounts of antimatter and seem like a path to commercial nuclear fusion would enable cheap and abundant clean energy and power spacecraft. The main net power gain and antimatter breakthroughs as proven lab capabilities could be well in hand within 6 years. Engineering the complete commercial systems could take another 10-20 years. 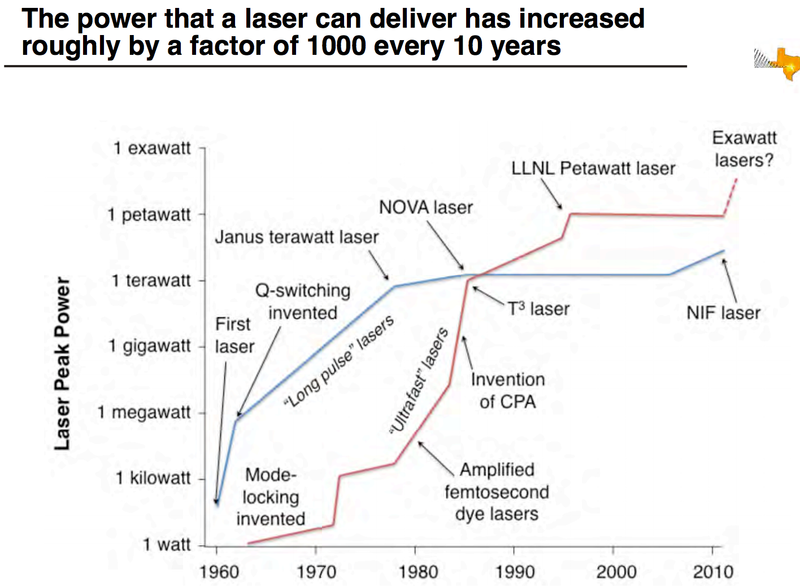 Ultra-high powered lasers have been increasing in power by 1000 times every 10 years for the last 40 years. They are continuing to improve at near that rate based upon projects being worked on today. In 2015, Japan fired a 2 petawatt laser and believe this could be a pathway to commercial nuclear fusion. A 10 petawatt laser should be operational this year. 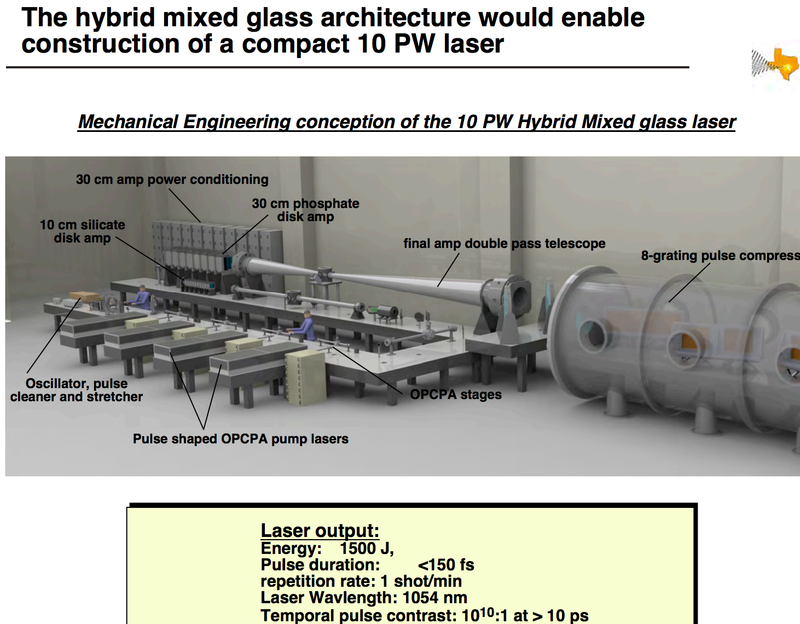 China has funded a 100 petawatt laser facility and plans to complete the laser by 2023. The 100 Petawatt laser might be intense enough to break the vacuum to generate large amounts of antimatter and matter. It is the intensity (watts per square centimeter) of the laser which will break the vacuum. The formulation for glasses needed for exawatt lasers is known. Liquid cooling can enable one shot per minute or better. There are other laser types that have lower power but very high repetition rates. One of many goals is to increase the power and increase the repetition rate. In 2015, researchers at the Japan LFEX 2 petawatt laser calculated that 30PW picosecond laser pulses with 30kJ energy irradiating a solid cylinder of HB11 fuel of centimeter length and millimeter radius in a 10 kilotesla magnetic field may produce more than 280kWh electric energy (worth about $28). The calculation assumed a spherical reactor of more than 1 meter radius around a central reaction unit that is charged to −1.4 million volts. This voltage stops the generated alpha particles and converts their kinetic energy into electric energy. A very small fraction of this energy is needed to drive the lasers, and we further estimated costs of about $18 per shot associated with replacing the HB11 fuel and the reaction unit (which is destroyed each time) and recharging it. At a rate of one reaction per second, the generated electricity would produce a net income of over $300 million/year. In 2017, there was work by the startup HB11 Energy to commercial nuclear fusion with lasers that generate 10 kilotesla fields. Two recent scientific breakthroughs have opened a new way to laser fusion reactions according to startup HB11 Energy. It involves the reaction between hydrogen H and the boron isotope 11 (HB11) as uncompressed solid state fuel within an extremely high trapping magnetic field. Both of these conditions have been demonstrated by experiments and following predictions from computations. * lab experiments have been performed which indicate fusion yields increase by a billion times.